Keep Creating-What is the difference between Oils and Acrylics? 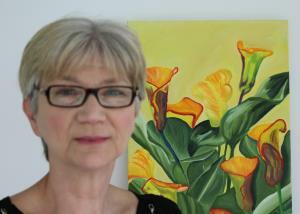 I paint with oil, acrylics, oil pastel and colored pencil. Each requires slightly different thinking when working. For the oil paint to go on the canvas easily a combination of linseed oil and turpentine mixture or some type of solvent added to it in small amounts(artists have formulas for this and have to be careful because paint will crack) and the oil paint takes much longer to dry, days, weeks or longer depending on the amount of paint used and the temperature and climate of location. Acrylic does not require this solvent mixture and dries fast within minutes again depending on the amount of paint applied to the canvas. With acrylic paint you can dip the brush in water and then begin painting, you can add a retardant to slow the drying process down. Paint companies have all sorts of additives for acrylic paint resulting in all sorts of mixed media combinations. With water mixable oil, a different product entirely, you need to be careful not to add too much water because the paint will crack. Each paint has a slightly different look in terms of shine on the surface, color of hue and so on. Each product requires certain products to use with it. Keep creating! Keep Creating-Why do a series? Have you ever painted the same subject over and over again? If not, you may want to start. Why? You can learn so much from painting the same still-life or landscape many times. You will see objects in new ways. Study how the light falls on the object and the way all the shapes in a scene relate to each other. You can start out with a quick sketch and then do a slower more detailed study. Then move on to painting it. 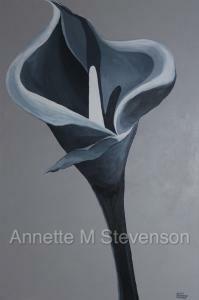 Try painting in black, white and gray, then move on to a different color and try all blues in your still-life or certain hues in your landscape. Then paint another canvas with a predetermined color scheme. You can do this with many different color palettes. You will be surprised how each painting turns out and how much you learn from each painting. Keep creating! Do you have trouble finding the time to draw or paint? You can take a small travel kit with you of paper, a few color pencils, ink pens, or small watercolor kit with watercolor paper. You can find 2.5X3.5 inch artist trading cards or small sketchbooks for sale at art supply stores. The front cover of the sketchbook lists the type of paper it contains for pen, pencil, or watercolor. Sketch for about 15 minutes. It does not sound like much when you start but soon you will have small completed works of art. This helps to solve the time problem. Keep creating! Do you ever have those days when you are so frustrated you do not know what to do? You've just had it. Paint your way through it. It doesn't matter what the finished work looks like, all you need to do is paint. Paint out the frustration. Then plan another painting about the frustration. Plan your ideas out. Plan out what you want to say in the painting about your frustrations and then paint. Work through it. You may be surprised when you look at your finished painting. It may turn out to be just what you had in mind or it could be a piece of crap. It doesn't matter. It will help you get through and over the frustration. My Windswept Series is about frustrations of life. The first in the series is a painting about the frustration you feel when you read too many social media comments. Just get away from the computer. Paint, draw and create your way through it. A painting is an expression of the artist about the world, the beauty of a peaceful quiet lakeside retreat or the beauty of a flower. One of my favorite flowers is the Calla Lily representing faith, purity, liveliness, innocence, resurrection, rebirth and overcoming challenges because it easily sprouts anew. 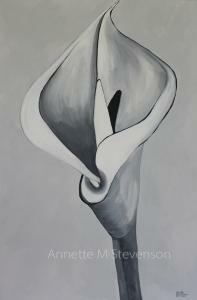 In the painting Solitude, shown here, a single Calla lily displays a quiet strong resilience, fortitude and beauty. The flower stands alone without being lonely. Artists respond to the visual world and words do not always come easy for some people, this is the reason why we paint and are artists. 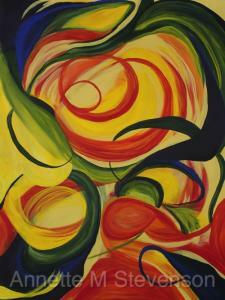 To express with a brush and paint our innermost feelings and thoughts is our goal. Many times we express our imaginations and other times we make marks on paper or canvas for the sheer fun of watching some magical image appear. We can spend hours or days formulating the idea before painting it. And some days we have nothing. On these days it is a good idea to look around, take a walk, relax, then take out a notebook and write down anything that comes to mind. It does not need to be complete sentences one word or a list of subjects will do to help dream up an image. Sometimes it is a good idea to work out a problem such as paint an abstract painting with five circles and 3 squares with a particular color scheme. This process may lead to a fantastic painting. Where do you get your painting ideas?